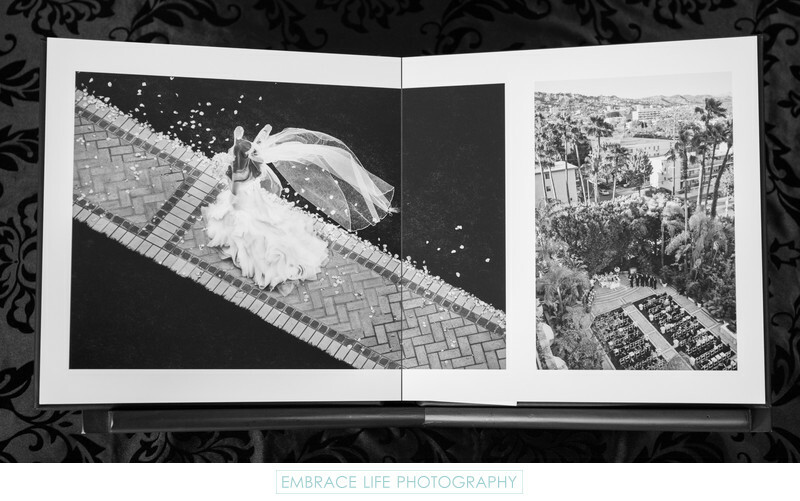 Pictured on this two-page album spread are two black and white Four Seasons Los Angeles Persian wedding photographs. The first, shot from an incredibly unique angle, high above the bride, captures her veil flowing gracefully in the wind as she walks toward the sofreh and her awaiting groom. The other, from the same spot, shot with a wide angle lens, gives a great sense of place, showing the ceremony site, the surrounding palm trees, city view and mountains in the background. Location: 300 South Doheny Drive, Los Angeles, CA 90048. Keywords: Elegant Album (45), Luxe Album (51), Standard Album (21).